Tiredness is not a weakness but a regular part of your energy levels. You can’t work intensely for hours on end without stopping to rest. 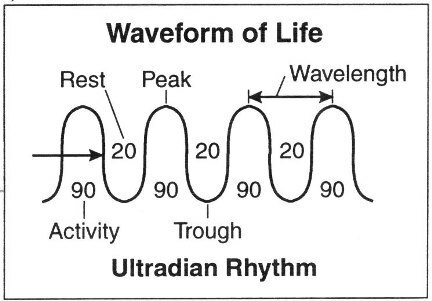 According to your body’s ultraradian rhythms, you feel naturally awake and focused for about ninety minutes at a time. Try working in 90-120 minute increments with 20-30 minute breaks in between. Play around with what kind of intervals and work rhythm works best for you. You may have to work up to prolonged periods of focus for up to two hours at a time rather diluting your attention by multitasking throughout the whole day. The important thing is that you’re checking in with your work rhythm. Are you low-energy, fidgety, or distracted? Have you been cramming for hours? Start listening to yourself to know when to push, when to rest, and how that cycle flows. We often don’t consider the optimal moment to do things — whether in rest or activity. When you tune into how you’re feeling, your motivation and quality of energy levels, you’ll notice there are actionable moments, times in which you’re infused with strength and energy that you can use to your advantage. That might mean not scheduling a long meeting right after lunch, or putting off intense work for the afternoons if you’re not a morning person. It might be that you allow yourself a rest after a setback or using the energy you get from making progress to tackle a challenge. How am I feeling right now? Is that feeling mostly related to my body, mind, or spirit? How do I want to feel? What does my body, mind, or spirit most need to feel that way? Then match your break-time activity to the desired energy level. So, instead of turning straight to coffee or pushing on when feeling unfocused, check in with where you are. If you’re physically tired, take a walk, for example. Brain fuzzy from concentrating? Read something fun or doodle. Spirit drained from dealing with a difficult client? Do some yoga poses or play a game. The productivity model of working like a machine is so removed from a human being who has feelings and relationships and needs like rest and ice cream that our language around awesome productivity revolves around destruction — crushing it, killing it, execute! Consider how we can best create and breathe the most life into things, to think about productivity not as increasing the efficient completion of tasks and production of widgets but a quality of movement.